Not many contemporary travellers to the Mediterranean coast of Turkey are aware that one of the first scientific expeditions to this region had been organised and led by a Polish traveller and researcher, Karol Lanckoroński. He was also a writer, art collector and historian, born in Vienna in 1848 to the extremely wealthy and powerful magnate family. During his life, Karol Lanckoroński not only became a member of the Polish Academy of Learning and the vice-president of the Society for Cultural Protection but also travelled extensively. Family fortune gave him the freedom to develop his various interests that, in the 80s of the 19th century, focused on the area of Asia Minor. He went there for the first time in 1882, as a member of a research expedition, which was led by Otto Benndorf. Their party set sail from the port of Antalya (known then as Adalia) and the subject of their research was the area of Lycia. This expedition made a great and lasting impression on Karol Lanckoroński. Some years later he recalled this time by these words: 'The beauty of the crossing and the first view of the city [of Antalya] exceeded my expectations and my extended stay there only contributed to perpetuate this impression.' He was particularly surprised by the ancient ruins of the region that he found there in far greatr number than he had expected. It must have been the moment when the idea of organising his own research expedition to Asia Minor first germinated in his mind. He mentioned in his memoirs that: '[ancient monuments] are scattered in a circle a few miles away, and they had never been described or only insufficiently studied'. 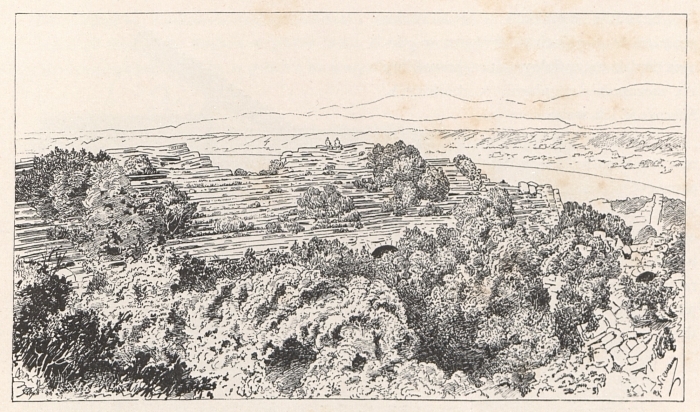 Moreover, this experienced traveller was astonished by the pure beauty of the Mediterranean scenery that he describes in these enthusiastic phrases: 'I had been even more enchanted by the wonderful area that no other surpasses and only Roman Campania matches'. This comparison of Pamphylia to Campania is rather exaggerated, although it demonstrates the amazing magic of Asia Minor that causes even most experienced travellers to forget calm reasoning. Lanckoroński returned to Asia Minor in 1885, this time as the leader of an expedition that was financed from his own assets. He was accompanied by the famous Polish painter Jacek Malczewski, who worked as an illustrator of the expedition. During this journey, Lanckoroński visited many ancient cities, both on the Mediterranean coast, and those hidden deep in Taurus mountains. His team managed to get to Antalya, Termessos, Perge, Sillyon, Aspendos, Side, Kremna, Sagalassos, Selge and other, smaller sites. The expedition even managed to get to Phrygia, where lake Beyşehir area was carefully studied. The members of Lanckoroński's team noticed some Hittite inscriptions there. It's worth remembering that this was at a time when the Hittite language was not yet understood and the beginning of excavations in the capital of the Hittites - Hattuşaş - was to begin in 30 years. To reach this region, the participants organised the Taurus Mountains expedition, which was commemorated in one of Malczewski's paintings. On the way a lot of information about the geography and topography of the southern part of Asia Minor was collected. 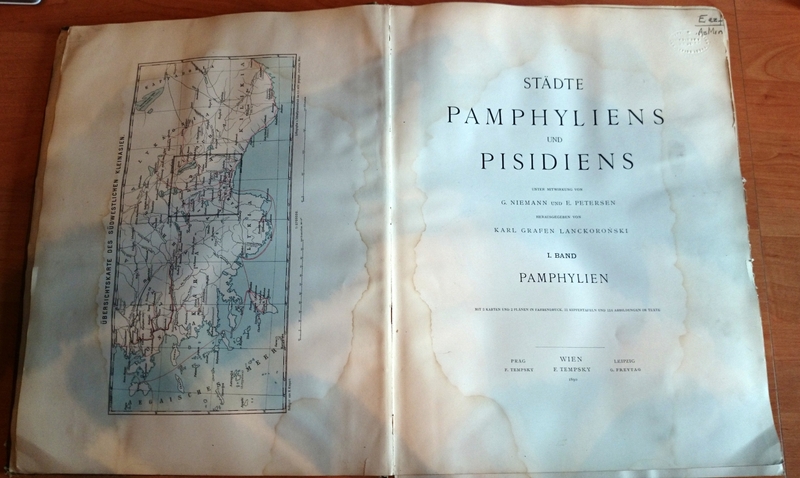 The main result of this expedition was a two-volume work by Lanckoroński - The Cities of Pamphylia and Pisidia. It was first published in German (as Städte Pamphyliens und Pisidiens) and then translated into Polish and French. 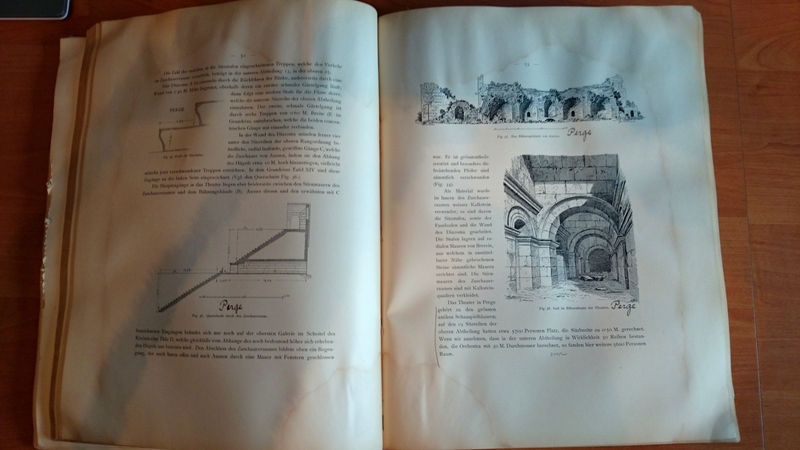 Even today this publication is an essential source of information about these historic lands for researchers interested in archaeology and art. This book is particularly important also because not all of the described sites have remained intact to the present times. What's more, some of these ancient cities (e.g. Selge) have not been studied any further. The book's continuous value can be proved by the fact that its first volume - Pamphilia - appeared for the first time in the Turkish version in 2005. 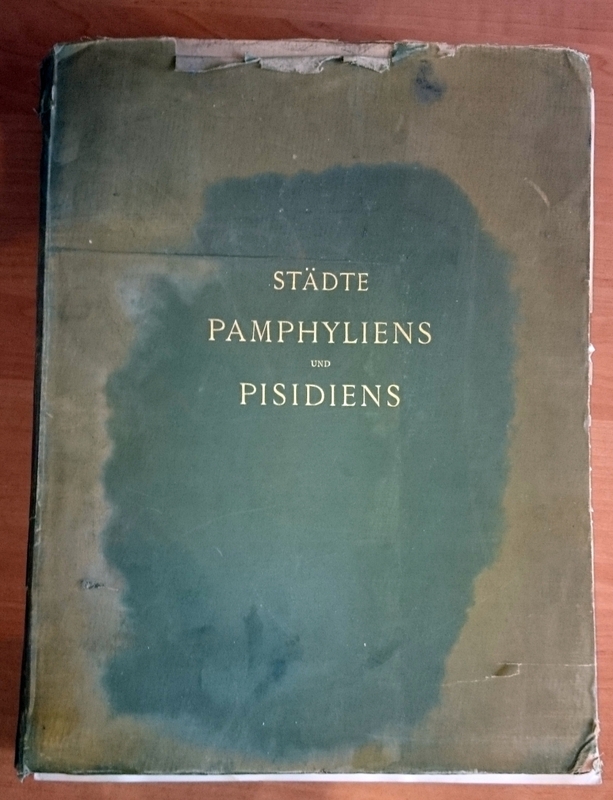 Our copy of the first volume of 'Städte Pamphyliens und Pisidiens' focuses of Pamphylia. 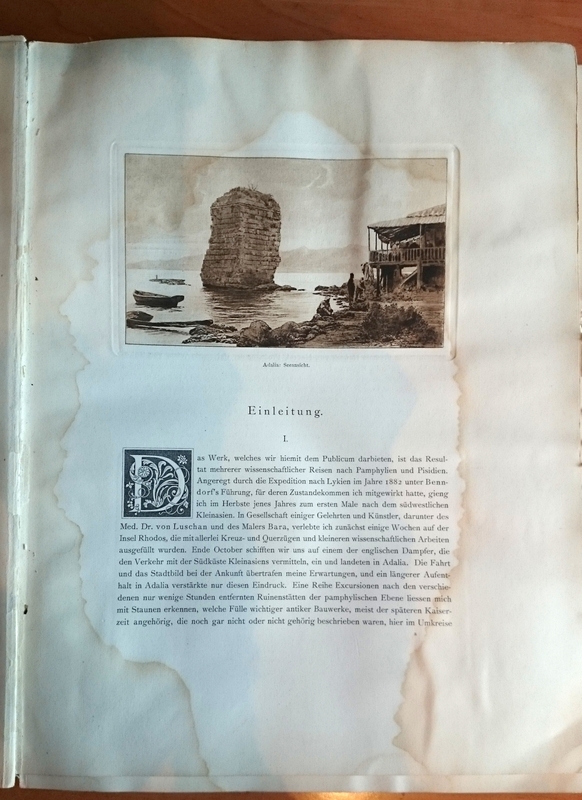 The book was published in 1890 in Vienna, but we managed to find it on American eBay. How did this volume travel to the USA? We have no idea, although the stamp of Jewish Theological Seminary is clearly visible on the front page. Obviously, someone was studying the contents to the great extent as there are some notes made with a pencil on the margins. Now the book is back in Europe and provides a great inspiration during Turkish Archaeological News journeys. If you are interested in studying the book, you can read it online or download it from Internet Archive website.